Made with drop forged heat treated high speed steel (HSS) with titanium nitride coating for longer life time. 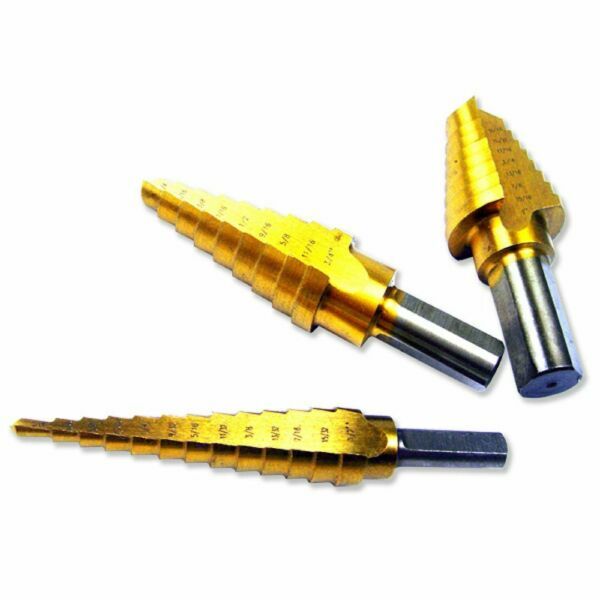 High speed, titanium nitride coated steel Replaces 28 separate drill bits. Two-fluted design for fast, smooth cutting. Automatically deburrs holes as you drill. Six step bit: 3/16", 1/4", 5/16", 3/8", 7/16", 1/2"
Nine step bit: 1/4", 5/16", 3/8", 7/16", 1/2", 9/16", 5/8", 11/16", 3/4"
Thirteen step bit: 1/8", 5/32", 3/16", 7/32", 1/4", 9/32", 5/16", 11/32", 3/8", 13/32", 7/32", 1/4", 9/32", 5/16", 11/32", 3/8", 13/32", 7/16", 15/32", 1/2"